Report Report Scheduler is an automated interface that gives you the option to email the reports on periodic basis. This feature is available in Ingress Software and you can set the file to be sent in a variety of formats using Simple Mail Transfer Protocol (SMTP). Report Scheduler helps streamline the delivery of reports and optimizes the running of many reports on your network. By using the Report Scheduler in Ingress, you can create a weekly schedule, whereby the system can email you the collected data even though your Ingress server is turned off. 1. Log in to Ingress Software and go to System Settings tab > Email > Configure the SMTP Server, SMTP Port, SMTP Email and SMTP Password. *We strongly recommend you to use your own company mail server as SMTP domain rather than using Gmail service provider to avoid server blocking the software from sending the email on behalf of the account owner. 2. 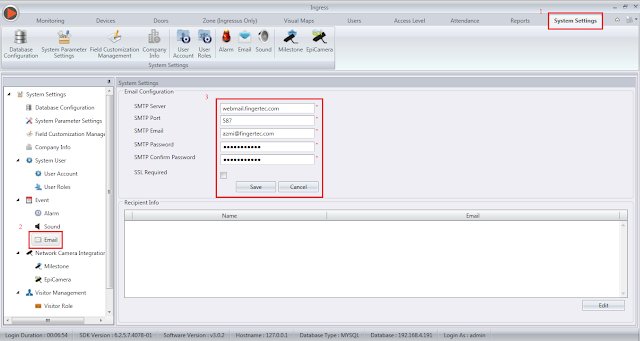 Add the recipient email and click Ok and save the settings. 3. 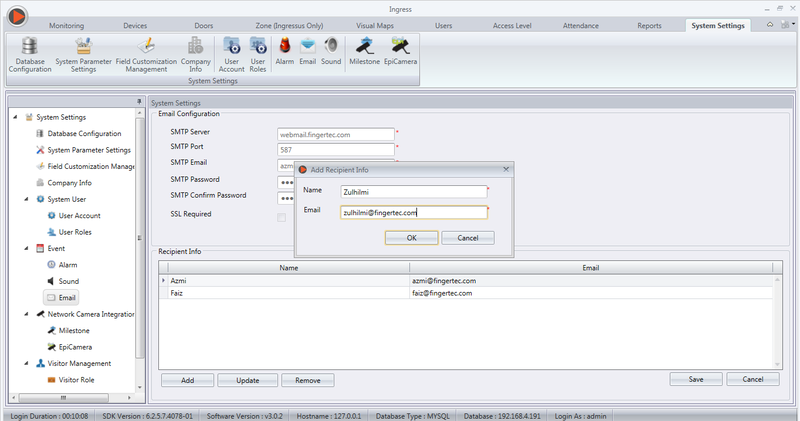 Next, configure the Report Scheduler format by selecting the Report tab > Report Scheduler > Add Report. 4. 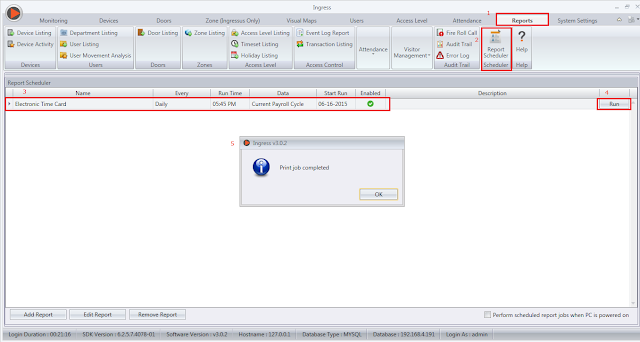 Here you can select the type and date of report. 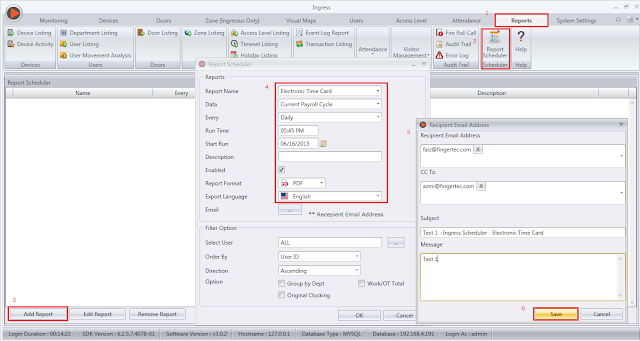 You can also set the Report Scheduler run time, recipient email address, subject of email and message. 5. Click Save once you are done with your settings. 6. List of reports will appear in Report Scheduler table. Select Run to test run your Report Scheduler features in your Ingress Software. 7. System will automatically send the report via email based on the scheduling timing that you have set. Report Scheduler is not working as per settings? Follow the steps below to troubleshoot. a) Main configuration: It’s important to ensure that all services; database, attendance service, etc, are running smoothly. If the Report Schedule is not working, it’s recommended that you restart all the services again to trigger the scheduler process properly. 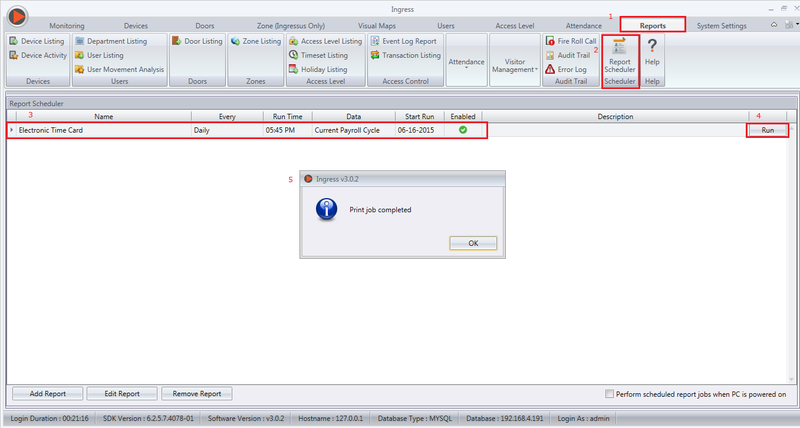 b) Once restarted, click Run in the Report Scheduler settings to trigger the scheduling process again. Please provide us your Ingress Software version. To check the Ingress Software version, Please click Ingress icon (Top left corner) , then click About US. I have tested using Ingress V3.0.6.29 and found it able to work. Good day to you. Referring to your issue, please note that it is not recommended for you to use Gmail, Yahoo, and other known SMTP servers, as these servers are known to block the software from sending an e-mail on behalf of the users. 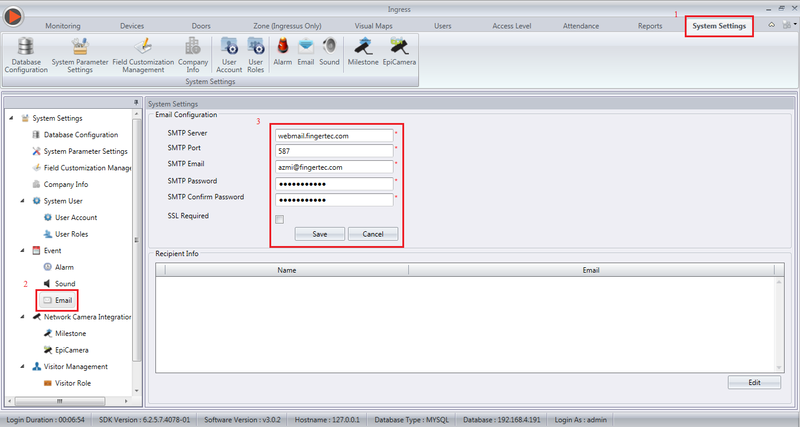 It is recommended for you to use your company's own SMTP server to be used by Ingress to send the reports. Actually this version is a piece of work, May you advise how can we stop sending reports in the off days?